Often when we are in the car, the tipster and I listen to Chuck Berry’s Great 28. When "Maybelline” is playing, I absolutely love the instrumental break in the middle where Willie Dixon pumps that pre-Fender acoustic double-bass. I turn the volume up for that exciting rhythmic sound. Another great track on that CD is “Roll over Beethoven”. Since it contains the lyric: “Move on up just a trifle further”, my BW always comments that I turn the volume up just a trifle when Willie Dixon plays bass in the middle of “Maybelline”. Since trifle is not commonly used, we always find it humorous when it is sung in the rhythm and blues classic. My spouse reminded me last time that her mom, who was a war bride from Great Britain, made a trifle dessert at home on special occasions. I vaguely remembered it as a layered dessert, but had never tried one. Trifle goes back to the sixteenth century, where it evolved from an earlier, similar dessert known as a foole. In the seventeenth century, milk was added to sweet cream custard and was poured over bread infused with alcohol. A variation to the trifle is the Creole trifle, more commonly known as Russian cake. I walked into a fancy bakery just outside of New Orleans years ago, looking to get a single serving bakery treat. They had all these fancy cakes, but the proprietor showed me a gaily coloured slice of “Russian cake”. It was a fruit -syrup soaked slice of cake and it was moist and sweet. I later found out it was an ingenious way to recycle old cake. They take pieces of leftover cake and mould them with the syrup and pack firmly. This is how some “puddings” originated - as a means to use up stale cake. But just as French toast requires stale or dry bread, a trifle needs a dry cake, for absorption. The English trifle is very similar to an Italian dessert called Zuppa Inglese and a Spanish one called Bizcocho Borracho. In Austria they call it Punschtorte. 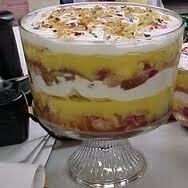 The word "trifle" comes from the old French term meaning something whimsical. A proper English trifle is made with real egg custard poured over sponge cake soaked in fruit and sherry and topped with whipped cream. Cut cake into ½ inch cubes. 2. In heavy saucepan beat eggs and egg yolk. 3. Stir in light cream and sugar. 4. Cook and stir over medium flame until mixture coats a spoon. 5. Pour this custard into a medium bowl and place this in a bowl of ice. 7. Put half of the cake cubes in the bottom of a 2 quart glass bowl. 9. Using small dollops of jelly put all over the cake. 10. Spoon peaches and strawberries over. 11. Top with remainder of cake cubes. 13. Spoon the cooled custard over the cake. 14. Beat the cold heavy cream, powdered sugar and vanilla. 15. Keep beating until peaks form. 16. Spoon the whipped cream over the custard. 17. Cover and refrigerate overnight or at least 8 hours. 18. When serving, garnish with mint leaves or extra fresh fruit. The completed trifle looks very beautiful and this recipe is my favourite. I don’t care for the gelatin or the pudding mix trifles. This is not difficult once you get the hang of it and contains wholesome groceries. If you so desire, you can substitute thawed and drained frozen peaches and strawberries. But don’t trifle with it too much, it’s a great dessert. loved your write-up on trifle; nice looking dessert ! It looks so gorgeously decadent but the ingredients are simple. Even I could do that one. I love trifles! It may stem from "whimsical" but it's "delicious" to me. Priya Sreeram: Thank You. It's a fine dessert for a crowd, and very visually appealing. Andrea the kitchen sorcerer, I mean witch. Thank you, I hope you try it. Sarah: Yeah sure, even un-risen would be good. Check your baking powder, it might be old. Whenever you have leftover cake (Yeah right!) you could make this. Manzanita: I think you can, I think you can. Of course you can. Al Penwasser: Are you sure you are not trifling with me? You do like them don't you. So much interesting informations about delicious desserts! Darlene: Thank You, glad you likeed it. My hubby will love to try this - he loves to make desserts. Thanks for the comment on my blog today. Your writeup is quickly becoming my source of trivia about these dishes. Like how you spend time to do your research on food and share it with us. Trifle is one dessert I can always count on as its relatively quick to fix and well liked. I am a huge fan of the trifle, though I make mine alcohol-free. I love your description of the Russian Cake too. I need to find that and look into it a bit more. Any dessert that contains levels of cake, fruit and pudding gets my vote! Aipi:I thank you for those kind words. Jolene:It is a British classic for good reason. The mom chef:You can omit alcohol and use a fruit syrup I think. Sherry does have a nice flavour though. The history is almost as good as the recipe. I remember reading French originally used sauces to cover up the smell and taste of meat gone bad. I guess it comes down to not wasting food, but finding ingenious ways to use it and make it look and taste good to the consumer. Finally I got a good recipe for Trifle, love everything about this trifle. Stephen: Is true about sauces covering up less than fresh food. Spices too. Spices came from the far east,were expensive. Columbus said could get there quicker. Discovered America by mistake. And the rest is history. Kaveri: Thank You for commenting; Trifle is a great dessert. Umm Mymoonah: I'm happy that you like this Trifle. Thank You. Elizabeth: Not my photo, I don't know how to work that yet. That "Darkspell" is a winner. My spouse is working on a YA novel, it's half done. Shish! Now I'm in trouble. I've been avoiding making a trifle. LOL. 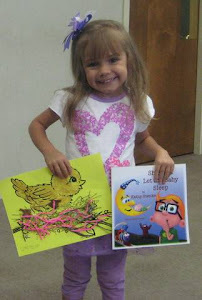 I have almost the exact pic on my blog of one I made last summer. I actually had to take a second look. Oh my. I'm off to bed and guess what I'll be dreaming about? Bet you a Loonie I'm making one tomorrow. Congratulations to your sweetie and her huge accomplishment. Mmmm that trifle looks and sounds delicious! I guess just like the origins of so many recipes it's a case of waste not, want not. Can't wait to try your recipe! Thanks for your comments on my posts about mangoes and steaks. I totally take for granted that everyone has the same access to fresh produce that we have here in South Florida. I will be writing more about mangoes soon because I just went yesterday to Hatcher Mango Hill to pick up their special Hatcher mangoes. Can't wait to taste them but they are not quite ready. Of course you are right about marinating, it not only adds flavor but tenderizes at the same time. The top sirloin steaks were not tough at all. They were quite tender, just not as butter soft as the filets. Don't trifle with it---you're so punny. This is a lovely dessert that looks perfect for summer! Don't avoid trifle it's good. Sandy: Yes it's easy to take things for granted. I can't get good fresh mangoes, but found canned mango at reasonable price. Nicki: This is a lovely dessert for like when dining outside, you can bring the whole thing out and it's very alluring. I'm a vegan (no milk or animal products) so looks like I'll be doing A LOT of substituting! L.: You'll do a LITTLE substituting! I know vegetarian people who go way back. 1. There is "egg substitute"
2. I've heard of "vegan custard powder"
3. Good ole plain soymilk. So there you go, I bet it could still be good. Thank you for the history behind trifle! The Golden Eagle: Thank you for your interest, I think you like history too.I've read good history from you. Shelley: It is yummy. I find history interesting. '''UMUTSEPETI''' : Thank You for your comment. I love this cake, looks very good. Greetings. great post and I pinned your English Trifle.